Tulip 37ml Metallic Fabric Paint	There are 11 products. 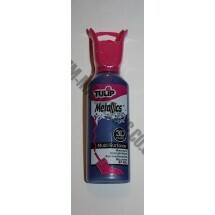 1 * Tulip 3D Fabric Paint Metallics 37ml - Black. See our Dylon and Pebeo range on our site too. 1 * Tulip 3D Fabric Paint Metallics 37ml - Buttercup. See our Dylon and Pebeo range on our site too. 1 * Tulip 3D Fabric Paint Metallics 37ml - Gold. See our Dylon and Pebeo range on our site too. 1 * Tulip 3D Fabric Paint Metallics 37ml - Green. See our Dylon and Pebeo range on our site too. 1 * Tulip 3D Fabric Paint Metallics 37ml - Heather. See our Dylon and Pebeo range on our site too. 1 * Tulip 3D Fabric Paint Metallics 37ml - Midnight Blue. See our Dylon and Pebeo range on our site too. 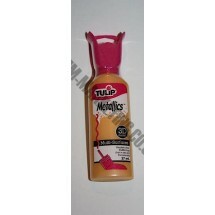 1 * Tulip 3D Fabric Paint Metallics 37ml - Orange. See our Dylon and Pebeo range on our site too. 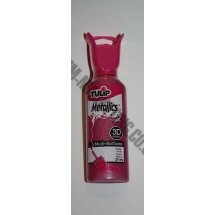 1 * Tulip 3D Fabric Paint Metallics 37ml - Pink. See our Dylon and Pebeo range on our site too. 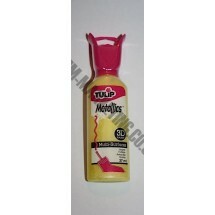 1 * Tulip 3D Fabric Paint Metallics 37ml - Red. See our Dylon and Pebeo range on our site too. 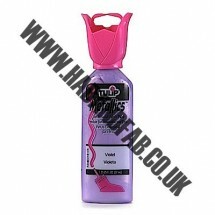 1 * Tulip 3D Fabric Paint Metallics 37ml - Violet. See our Dylon and Pebeo range on our site too. 1 * Tulip 3D Fabric Paint Metallics 37ml - Yellow. See our Dylon and Pebeo range on our site too.